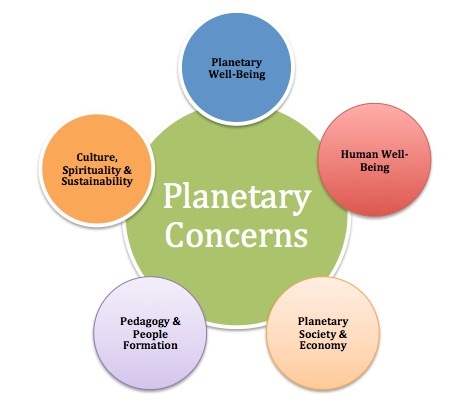 Our concern for the well being of all physical and biological aspects of the planet and ecology related to them. Our concern for our individual and collective well being, covering such areas as misery and happiness, friendship, better communication, and trust, pain, conflict and reconciliation, etc. Our concern of economic, social and political disasters of a purely growth-oriented economy. Our concern for value creation that supports life and ecology and promotes happiness and achievements-based on de-growth/post-development. Our concern for a humane, but not human-centered, economy. Our concern for alternative lifestyles that promote peace and community, less having but more being, truthful communication, shaping alternative educational initiatives (as against factory modes) that nurtures safe, ecologically sound and more meaningful futures, creating spaces for human spiritual regeneration.